Historically, cavalry were troops who fought from horseback. They were expensive to raise, train, and maintain, so they did not usually make up the main body of an army. Instead, the main body was composed of much less expensive infantry, and the more mobile cavalry acted to scout the enemy, screen one's own movements, and act as a shock force at crucial points in battle. By the start of the Pacific War, horse cavalry were all but obsolete, as the horse was being replaced by the internal combustion engine. The U.S. 26 Cavalry Regiment was stationed in the Philippines when war broke out and became the last U.S. horse cavalry unit to see combat. The Frontier Force in Burma carried out the last British cavalry charge, its commander and most of his men being slaughtered by Japanese machine gunners. Both the Japanese and Russians maintained some independent horse cavalry on the Asian mainland, with 4 Cavalry Brigade remaining on horseback until the final surrender, but these played no role in the Pacific. Some regular Japanese infantry divisions may have retained a cavalry regiment (with a strength of about 950 troopers organized into three rifle and saber companies and a machine gun company) as their chief reconnaissance element until quite late in the war. 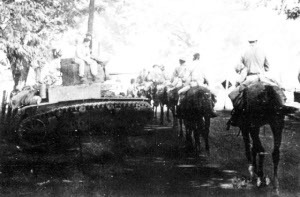 For example, the British encountered a small force of Japanese cavalry near Nyaunglebin ( 96.726N 17.955E) in Burma during the 1945 race to Rangoon. Armor was seen as the natural successor to horse cavalry by many military experts, as it was also an expensive mobile force with great shock value. This led the British to develop what amounted to two armor forces in parallel. Infantry support tanks were viewed as mobile pillboxes whose role was direct support of the infantry, while cruiser tanks were seen as the new cavalry. It was soon discovered that light cruiser tanks were no match for German armor, and the distinction between infantry support tanks and cruiser tanks faded as the latter received heavier armor and armament at the expense of mobility. Mechanization of the U.S. cavalry was well underway when war broke out in Europe in 1939. Most of the remaining horse cavalry regiments were converted to armored regiments in early 1942 and reactivated as fully mechanized cavalry in 1943. By the time 1 Cavalry Division arrived in Australia, it was essentially an elite infantry division with a unique organization, consisting of two brigades of two regiments each of two squadrons (analogous to battalions) each. Each regiment numbered about two thousand men. Heavy weapons troops were assigned to each squadron, and division artillery consisted of two battalions each of 75mm pack howitzers and 105mm howitzers. Other cavalry were fully mechanized and organized into small groups whose role was exclusively reconnaissance. Most of these were employed in Europe rather than the Pacific.